Due to economic instability, in January of 2000, then Ecuadorian President Jamil Mahuad instituted a policy instating the United States dollar as the official currency of Ecuador. Despite disapproval of the policy by current Ecuadorian President Rafael Correa’s administration, no plans are currently in the works to replace the US dollar as the official currency. However, the administration has indicated that it would replace the US dollar in favor of a South American currency if one became available. The dollar replaced “sucres” in Ecuador, at a rate of 1 for every 25,000 sucres. 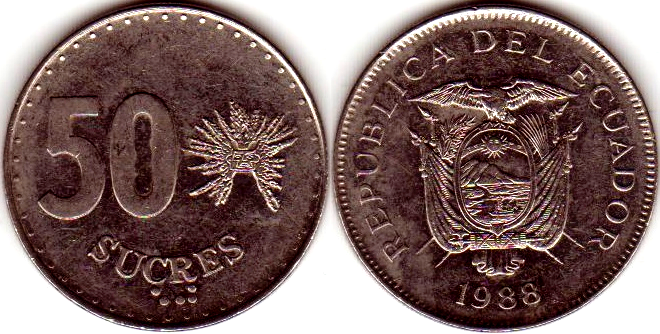 While Ecuador has officially replaced their own currency with the US dollar, the country still issues “centavo” coins, which are identical to their US counterpart. Interestingly, these coins are not actually made in Ecuador, rather, they are minted by the Royal Canadian Mint as well as the Casa de Moneda de Mexico. Apparently Panama and El Salvador also officially us the US dollar as their currency.